Ever wonder how far a fallen leaf travels from its tree? A pretty pair of leaf earrings made a journey all the way from Georgia to land in my mailbox. Now they're hanging from my ears, thanks to Trinkets by Dana. They're the longest dangle earrings I've ever owned, measuring almost 5 inches. 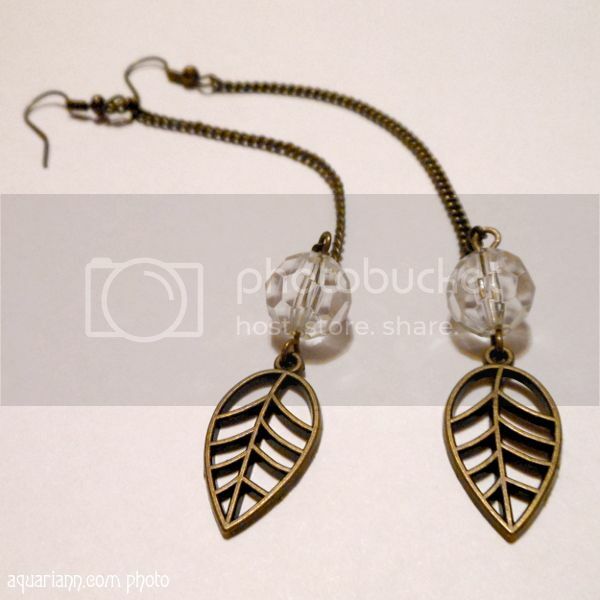 However, the boho design is so lightweight that I feel like I'm wearing real leaves instead of bronze charms attached to a matching antique brass tone chain. The clear faceted beads complete the elegant look with a subtle sparkle. My leaf jewelry collection is definitely piling up! If you also want a memento of autumn to gaze at during other seasons, don't forget to enter Dana's Jewelry Giveaway before December 15, 2014. The winner will receive an elk necklace and a fall leaves photo print. Disclaimer: I received these free earrings as a thank you gift for hosting a jewelry giveaway. If you think your creations would harmonize with my whimsical ramblings, learn how to sponsor a giveaway here.